!!!!! COAL POWER PLANT SIMULATOR !!!!! Try this NEW! and challenging simulator game for the iPhone, iPad and the iPod Touch. Totally Ad free and no In-App purchases. !!!!! CAN YOU KEEP THE POWER PLANT RUNNING !!!!! 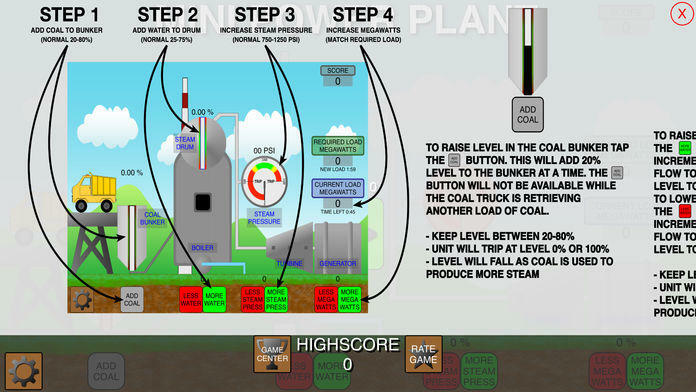 Grab control of the simplest little coal power plant simulator on the app store. Simple touch screen operation allows you to take control of some critical power plant processes starting from coal supply all the way to power on the grid. 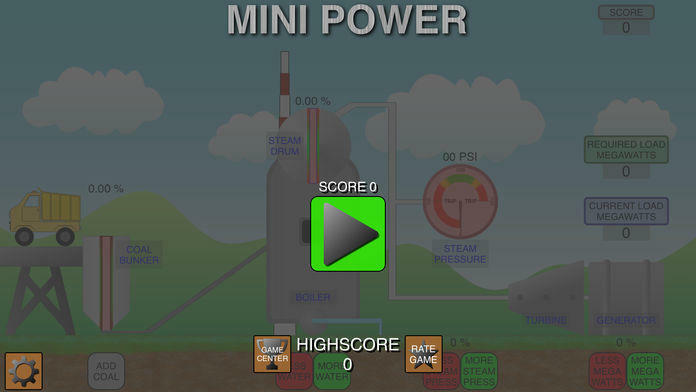 Your GOAL is to keep the power plant running to achieve the highest score possible. Send the coal truck out for another load of coal to maintain coal bunker level. Control makeup water flow to the boiler to maintain steam drum level. Control firing rate of the boiler to maintain steam pressure. 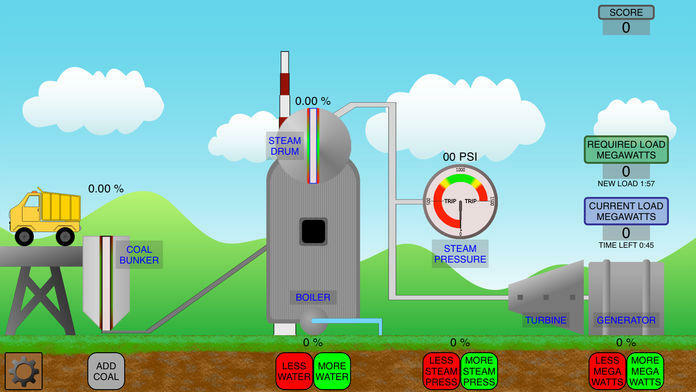 Control steam flow to the turbine and generator to maintain load. In time game gets increasingly more difficult to play. - Control four separate processes to keep the power plant running. - Simple touch screen game play. - Tap to add coal to bunker. - Tap to control makeup water. - Tap to control firing rate of boiler. 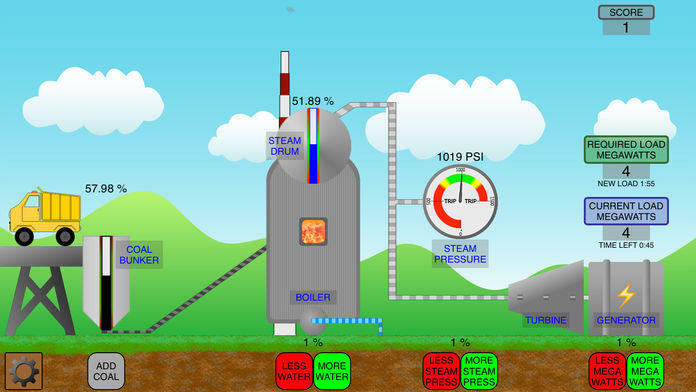 - Tap to control steam flow to turbine. - Select Easy or Hard mode. 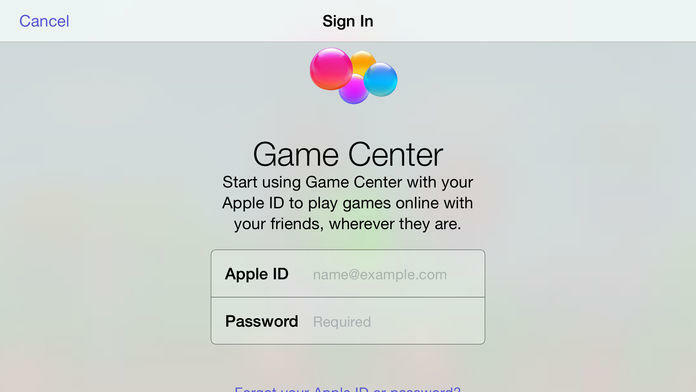 - Compete for high score on Game Center.